À l'aide de l'extrémité plate d'un spudger, faites levier sur le connecteur du disque dur pour le débrancher de la prise sur la carte mère. At this point I could remove the hard drive by gently pulling it. There is no need to remove the motherboard! +1: Don't remove the motherboard, and don't buy the tool to do it. When it's time to slide out the logic board, just push gently on the inside of the metal air guide fins on the intake. This will "eject the motherboard out the necessary 1/2 inch. Be mindful of the length of wires going from under the RAM out to the front of the case, as you don't want to pull hard or disconnect these.. I decided that there was a greater risk of breaking something by not removing the logic board than by removing it. The old hard drive comes out easily enough, but the new one would just not quite go in for me. Lining the screws on the outside of the new hard drive with the rubber grommets is so much easier with the logic board out. I used masking tape with pencil marks on the case and on the drive in order to line up the screws and the grommets with the case right side up. IMHO, by the time the antenna is off, removing the logic board is relatively easy. Stop at this step and gently pull off the drive. To align the new drive’s screws turn the Mac Mini in the air and just let the new drive lay on the case while pushing it to make the screws align with the holes. Yes, if you have come this far just pull the drive out because removing the bluetooth connector and the motherboard is troublesome. If you just pull the drive out at this point the only difficulty is when you try to put it back in because gravity is working against you: the drive has to hang in its slots about 1 cm above the top casing, which is on your table. The trick is to flip the mini up onto its front edge and after a couple of tries the buttons on the HD will engage their sockets. À l'aide de la pointe d'un spudger, soulevez le connecteur du capteur infrarouge pour le débrancher de la prise sur la carte mère. You can remove the hard drive by lifting out after step 9, it's not necessary to disconnect the wireless, nor remove the system board. I did not remove the IR sensor. I attempted to and it was very difficult, (I felt like I was going to snap or damage the logic board). I would advise skipping this part since it's not necessary to removal of the hard drive, and it seems like a number of people have damaged their logic board while trying to disconnect the IR sensor. Skip. That third screw on the lower right hand side should be removed in the beginning when you remove the fan. You can skip this step with no problems. Agree with all the previous: this step is not necessary to remove the second drive (the one closer to the bottom of the case. The connector is VERY delicate. That is true! I just used the tip of a screw driver in the screw holes on the drive to help slide the drive out. The hard part is putting the new drive back in position, due to the 2 screws at the back have to fit into the 2 holes in the rubber at the back of the bay. I finally stood the mini on end, so the drive would fall down into position. Then I stuck a suction cup on the drive to then pull the drive towards me to get the screws and the holes in the rubber to line up. This was my first time taking apart my Mac mini. I wanted to upgrade my hard drive and RAM. However, when I came to this step I pulled the motherboard out a little bit to hard (after tugging on it gently a few times, but it wasn't coming out) and the wires came out. So I was wondering is this fixable? Thank you. I managed to lift the IR connector and the base it connects to... I tried to put it back without breaking the pins but failed. Fortunately, the IR sensor is the least useful part of this device for me, so no loss. I tried to reconnect this IR plug, but managed to crush all the pins on the logic board. I was gentle the entire time, but I simply could not see how the two fit together, and I still don't. I broke off all the dangling pins and removed them and will now leave the IR connector dangle. These instructions should provide a better visualization for this step. And by the way, I had to remove this connector because I was replacing both drives of a Fusion logical volume. After fiddling with a spudger and then two spudgers and not being happy at all with the direction of the forces I feel that the only safe way to do this, in my opinion, is to slide something under the wires of the IR connector (I used a narrow cable tie, but maybe a suitably bent paper clip would do it too). Make sure this is sitting as close to the connector as possible and then pull directly upwards (away from the board). The idea being to exert a force equally on all the wires at right angles to the board. I accedentally broke the IR connector. How can I fix it? If the hard disk is at the ‘normal’ position and not in the upper position, you don’t need to remove anything else to get the disk out. Finger-tighten two long screws that fit the two holes on the drive and use this to remove the old drive, and then screw them into the new drive and use them to properly align and insert. Here’s a picture of what I did and it was super-fantastically easy. Sorry I wasn’t clear - - You use the long screws as handles to tilt and pull the drive out or to push it in and align it with the unseen rubber grommets. Une vis Torx T8 5 mm ou Hex 2 mm (les deux tournevis fonctionnent). Une vis Torx T6 16,2 mm. Un standoff Torx T6 26 mm. The 26 mm T6 Torx standoff is actually part of the the third fan screw which was removed earlier in order to get the fan out. If you skipped step 13, skip this one as well. Note: On my model, this was not a "pull up" cable that needs a spudger, it was a regular "slide" in connector. It would help if you gave your model. Thanks. Pour le retrait de la carte mère, les deux tiges cylindriques de l'outil de retrait de la carte mère du Mac mini doivent être insérées dans les orifices repérés en rouge. Attention ! Si vous insérez des instruments dans des orifices de la carte mère autres que ceux repérés en rouge, vous risquez de détruire la carte mère. Insérez les tiges de l'outil dans les deux orifices repérés en rouge. Assurez-vous qu'elles sont en contact avec le dessus du boîtier extérieur en dessous de la carte mère avant de continuer. Avec précaution, tirez l'outil vers la carte d'E/S. L'ensemble carte mère et carte d'E/S doit glisser légèrement hors du boîtier extérieur. Arrêtez le mouvement de levier lorsque la carte d'E/S est clairement séparée du boîtier extérieur. Retirez l'outil de retrait de la carte mère du Mac mini. You may not find it necessary to push out the logic board in order to slide in (or out) the hard drive. It helps to have the extra room to maneuver, but it can be done without. I had read all the comments thet said the HDD can be taken out at step 12, besides I'm in France, so I hadn't bought the special tool. when I realised I had to remove the logic board after all, I managed without the tool but I'm not doing it again. I inserted 2 screwdrivers in the holes and tried to move them both simultaneously. It worked but instead of sliding out slowly, the I/O board came out all the way with a noise! The clips from step 16 had unclipped by themselves, causing the noise. For a second I thought I had broken everything. I really don't recomment doing this without the tool. Instead of the removal tool it is also possible to use two metal pins with 2,5mm diameter. I didn't have the opportunity to get the removal tool before starting my tear-down but when I got to the Removal Tool stage I used a pair of small allen keys, just big enough to fit through the holes in the logic board. You can feel them engage into the holes below the logic board. Easy, steady pressure on both does the job well. I think the main thing through the whole disassembly process is SLOW and Gentle. This step may require more force than expected. I was very careful and pulled the remove tool out too early. You have to put a bit of will into it and push it at least 0.5cm (= 0.2 in), less won't do the trick. If you have no such tool, just skip this step. You can pull HDD anyway. For this, I discovered that no special tool was needed. I simply pushed the logic board towards the back of the case where the ports are, slid out easy peasy. Also, be sure to withdraw the special tool (or any substitute) before prying out the logic board more than just a bit. In my case, the tool restricted the board's movement, and it took me a while to understand why I wasn't getting anywhere. I used two 2.5 mm drill bits, turned upside down. They worked like a dream. It took me a little while to realize that they needed to be lifted slightly from the underlying case in order for the board to slide out. I put two small screwdrivers in these holes and pulled and had my son push on the far side of the logic board. It took two of us to get it to move. With a Mac Mini 2012 model, you DO NOT need the logic-board removal tool. I wish I had read these comments before I spent the ten dollars on the tool (I'm not criticizing ifixit here, but I wasted my money). You could always create your own logic-board removal by re-bending what's known as a "landscaping staple". It's just stiff steel wire. One can remove the hard drive without removing/moving the logic board. Once the hard drive cable is detached from the logic board, one can lift the side of the hard drive closest to the logic board just enough to clear the RAM bracket and then carefully slide it out. It may be easier to remove it with the logic board pulled out but in my opinion the logic board (and CPU) should be left alone unless it is absolutely necessary. Poussez simultanément les deux clips en plastique aux extrémités gauche et droite de la carte d'E/S vers le milieu de la carte et tirez la carte hors du boîtier extérieur. Sortez l'ensemble de la carte mère du boîtier extérieur jusqu'à ce que le bord de la carte d'E/S dépasse d'environ 1,30 cm du bord du boîtier extérieur en aluminium. Confirmed not necessary at all! Dégagez le disque dur du bord avant du mini et retirez-le du boîtier extérieur. Be careful when replacing the HD/SSD in this step. If you are not careful, you can mess up the rubber shock absorbers by misaligning the posts. If that happens, you will have a hard time getting the screws to line up when putting the perforated grille back on (wifi antenna grill). Exactly ! The easy way that I found to do this properly is to turn upside down the mac mini in order to have the HD at the top of the mini and the 2 screws at the back of the HD perfectly up at the level of the 2 holes on the shock absorber. I have macMini (late 2012) and buy a Samsung SSD 850 PRO 256GB to replace original 500GB Apple HDD. Your guide is OK, but in step 17 I have a big problem. HDD in my Mini was securing with two screws. So first I need to remove logic board and unplug the power connector. 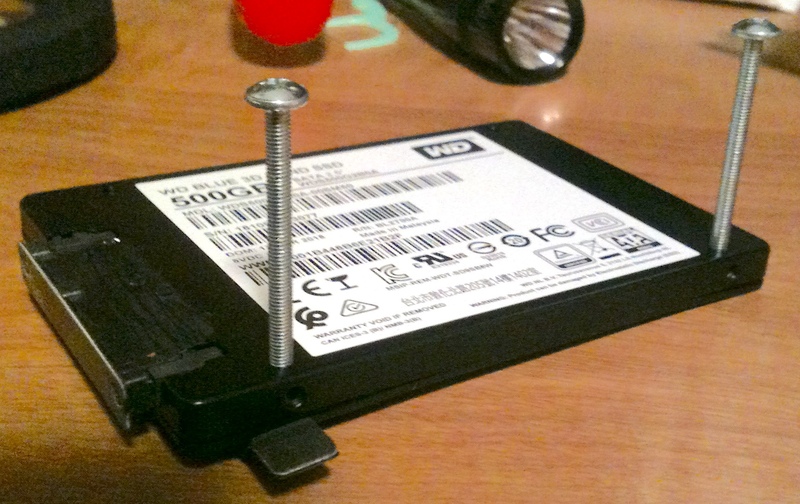 Then remove two screws from HDD side. Can anyone confirm that those "2 screw" holding HDD to plastic frame in step 17 are "T8 torx"? I can confirm as well. I pried off the large connector off the main board to get to those screws. They t8 and were screwed on very tightly in my case. My MacMini (bought late 2013), had the HDD installed in the upper bay, so a complete teardown was required in order to change the driver. However, if you are planning just to add a second driver, there is no need for the doubler kit (only a new lower flex drive). If you are having a !&&* of a time trying to re-position the upper HDD - or just putting it back in - try putting the screws from the antenna grill back into the two upwards facing holes in the drive and using them as 'handles'. The drive has 2 small screws on the forward edge that need to line up with 2 holes in the outer case and as the drive flops around at first it is really hard to hold & maneuver it at the same time. Yes. I used two plastic pegs to do this as well. Watch out for the wires running along the right hand side of the drive bay (as viewed when you’re putting in the drive) when you’re trying to lift up the drive to fit in the two recesses at the back of the bay so you don’t pull or stress them. You can pull the HDD out without sliding the board at steps 15 and 16. Quite tricky, but you can. I had the same problem as Roman, I just figured I would add that those "two screws" are T8 screws and that there is a cable on the right side which you should be careful about while removing and reinserting the said screws. In my model, this didn't just slide out. It was attached to a caddy that required removal of the power supply (see other guides for how to do this) which was a nightmare to get back in the same spot. I just did this upgrade and my HDD was secured with screws on both sides of the caddy. I actually think the caddy is really only designed to hold a single drive, kind of in the middle position, i.e., it's not the upper, or 2nd drive, position. In any case, this requires removal of the logic board, power supply, and caddy, entirely, in order to remove the existing drive. Tedious, but I didn't have any problems on reassembly. Because an ssd is thinner, I put the flat end of a spudger in between the ssd and the logicboard to prop it up and let the 2 bottom screws of the antenna plates ‘grip’ the holes on the ssd so everything is nice and secure. 2012 model - Had to remove (slide out) the motherboard assembly (disconnecting power cable from rear of mobo) in order to reach the two screws holding the HD in its plastic frame. Then the two rubber bumpers (when attached to the new SSD) didn’t want to go back into the mating holes in the frame. I trimmed off some rubber all around the bumpers until they fit. I expect the age of the mini plus all the heat hardened up the bumpers.